How to use your digital SLR camera white balance settings – auto, custom, preset, daylight, tungsten, fluorescent, flash, cloudy and shade. Setting the correct white balance in your digital SLR camera is important to ensure the objects that are white, are actually displayed white within the photograph. As you can see by the interactive example below, white balance also effects other colors as well. If your camera’s automatic white balance setting doesn’t get the color ‘white’ correct, it won’t render the other colors correctly either. How to know if the wrong white balance has been set? Just about every photographer at one stage or another, has taken a photograph that contained a blueish tinge. The blueish tinge is normally a result of using an incorrect white balance. For example, the first image below has a blueish tinge, where as the second shot displays a more natural coloring. Setting an incorrect white balance, can also result in unsightly reds, yellow or green tinges as well, depending on the situation. Doesn’t auto white balance fix this problem? Not always. While it’s true many improvements have been made in todays digital camera’s, they still often get white balance settings wrong in certain lighting conditions. If you take your images in RAW format (highly recommended) then sure, go ahead and use auto white balance. If the camera gets it wrong, you can always change this setting later on in your RAW editor. Where to find your digital SLR camera’s white balance settings? For Canon users, the camera’s white balance setting can be found on the back panel next to the LCD screen (on Canon 400D). It can be recognized by the letters WB, as demonstrated in the image below. 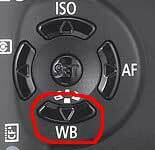 There can be slight differences between models, so if you can’t see the letters WB, then check with your camera’s manual. Press the WB button and you’ll be given a list of the following options: auto, daylight, shade, cloudy, tungsten light, white fluorescent light, flash and custom. For Nikon users, press the menu button on the back near the LCD screen, and navigate your way to the ‘Shooting Menu’. From there, you’ll be able to choose ‘White Balance’. Once you’re in the white balance screen you’ll have several options including: auto, incandescent, tungsten, fluorescent, direct sunlight, flash, cloudy, shade and preset. 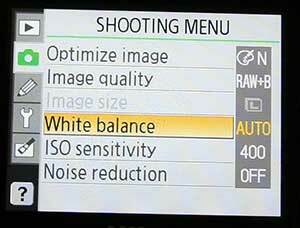 Note: If you have the camera set on fully automatic, you won’t be able to choose a white balance setting. Note once again, settings differ between brands and models. Therefore don’t worry if you have a few of them missing from your menu bar. When to use Auto white balance: In auto, the camera guesses what white balance to use depending on the available light. In 95% of the time, the guess results in a nicely colored photograph. This is a perfect setting for times when you’re unsure what white balance to choose. It’s also a good idea to keep the camera on Auto white balance if you shoot in RAW format (recommended). Daylight (Canon) and Direct Sunlight (Nikon): This is a good setting for direct sunlight. For example, a beach landscape mid morning where you’re not shooting into shade. 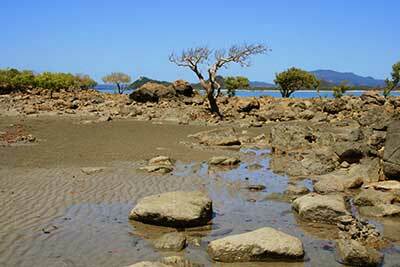 When to use Shade white balance: Use shade white balance in shady area’s or sunset shots. It will help give a warmer color to your shots. When to use Cloudy: This is a good setting for cloudy days. It’s also quite effective for shady area’s as well. I’ve found there is a fine line between shade and cloudy white balance settings. When to use Tungsten white balance: This is one of the most extreme balance settings of them all and should only be used with tungsten light bulbs. Or at times where you purposefully want a blue tinge to your images. When to use fluorescent: This setting will help make inside fluorescent house lighting, look a bit better than the yellowy orange color you usually see. Flash white balance: Flash white balance is used mostly for studio work. Custom (Canon) and Preset (Nikon) white balance settings: Use these ones with a white or grey card that you can pick up cheaply from any camera store, for perfect white balance.